Two weeks ago I authored a post on the signing of Gerald Henderson which discussed that with all the focus on Simmons and Saric, I believed the signing of the veteran free agent had flown completely under the radar. In short the analysis contained in the post said that Henderson’s 3-point shooting, solid perimeter defense and leadership skills would have a significant and immediate impact on the 76ers in 2016-17. This weekend Henderson will make his first visit to Philly since signing with the 76ers to assist his good friend and former Episcopal Academy teammate Wayne Ellington (Miami Heat) with Ellington’s “Peace Games” event. The “Peace Games” aim is to bring at-risk youth and young adults together while emphasizing gun violence prevention and advocacy. The event will take place at Girard College on Saturday, August 20th (noon to 5PM) and will include a basketball tournament open to the public. 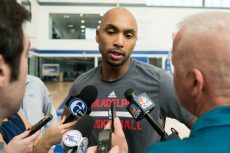 Henderson gave fellow Philadunkia scribe Michael Kaskey-Blomain and I a few minutes to discuss the “Peace Games” event and his role with the 2016-17 Sixers as well as Dario Saric and Ben Simmons. Philadunkia: You are coming to Philly to support your good friend and former high school teammate Wayne Ellington at his “peace games” event this Saturday at Girard College. Tell us a little bit about the event. Henderson: The “Peace Games” are this Saturday (8/20) starting at 12 o’clock and running until about five. It’s getting together Philly’s youth and putting them out there playing in a basketball tournament, I’ll be coaching…Wayne has run this the last couple of years (in other cities) and a lot of people have heard about his father passing a few years ago (Ellington’s dad died of “senseless” gun violence). So he wanted to put on an event that was going to promote non-violence and teach these kids that there are other ways of communicating and going about life. So it’s a great thing he’s doing and I am just happy to be a part of it. Philadunkia: We want to officially welcome you back home to Philadelphia and of course the 76ers. How does it feel to be home and be a member of the 76ers? Henderson: Man it really feels great. It feels great. I have said it since I signed, it’s a dream come true to play for your hometown team. I watched the Sixers while I was growing up in the area during the era of Allen Iverson and that group get to the Finals. Everybody knows how much the city was in love with that team. And that’s what we want to bring back to the city. I think we can only really go up in terms of how good we are going to be. We got a group of young guys, very talented guys that are eager to get better; eager to win. We have a great coaching staff. Coach Brown has been great communicating with me the second half of this summer. I’m looking forward to the opportunity of playing for an organization like this and the city as well. Philadunkia: Can you tell us a little bit about what the Sixers’ coaching staff has said to you about your role on-the-court for this upcoming season? Henderson: They know my game very well, especially with me playing in the Eastern conference for so long with the Hornets. They know I am going to bring energy every night and my defense. Offensively I am going to be a guy that attacks all game. They also emphasized to me how important my leadership role would be as one of the older guys on the team. Teaching guys how to work. What to do. What not to do. They have been very clear what they expect from me and that is something I am looking forward to. Philadunkia: How does it fel to take on that leadership role as opposed to that role you have had during earlier seasons in your career? Henderson: I got a taste of it last year in Portland, being the second oldest guy on the team, so I think it is something I will be used to these last couple years. It is something I embrace. I’m one of the older guys on the team, but in NBA years, I am not old. I feel like I have a lot left in the tank. I still feel like I have a lot left to give the game and I love the game so I am going to play as long as I can. Whatever I can do for this team to get us to be a better unit, I am going to do. Philadunkia: Have you had a chance to watch any of the Olympic basketball action down in Rio and witness any of Dario Saric’s play? If so how intrigued are you by what he can bring to the 76ers? Henderson: You know what; I have only really watched the USA. I have watched a lot of the other sports more than anything. Dario – I have seen his clips on YouTube and he’s a heck of a talent. They picked him for a reason and I am looking forward to him coming over. Philadunkia: Do you find it interesting that this city is so intrigued, some would say obsessed, with Saric? Henderson: (Laughs) Its always interesting. Some of the European guys come over and people wonder how their game will translate and what not. But he’s clearly got some skill, some size and a lot of people are hoping that he is going to stick here and do well. Philadunkia: Have you gotten a chance to play with or work out with any of the other young guys on the squad? Henderson: I haven’t. Jahlil is the only guy I have really been on the floor with and that was a couple summers ago at Duke. We played against each other quite a bit with me going back to get my degree and him just having finished up his freshman year. Other than that I haven’t played with any of the other guys. I made it to the Summer League (in Las Vegas) and watched them. Ben Simmons really impressed me with his ball handling and athleticism and passing ability. I have played against Jerami and I don’t know if it gets any more athletic than him in this League. We’ve got guys that can run and jump and fly around. Plus they have skills. I think the sky is the limit. We just have to come together as a team. Philadunkia: Your 3-point shooting has improved tremendously over the last several years and we all know how the NBA loves 3-point shooters now. Is your continued development in that area dictated by the current 3-ball happy style of play in the League right now or is that an area you would have looked to improve upon regardless of that current trend? Henderson: My bread and butter will still be my mid-range game but 3-point shooting is something that I have worked on more than anything over the last few years and that’s not just because everyone is shooting more threes, but it’s also the style of offense I have been a part of with the Hornets and the Trail Blazers last year, where if you were open, you let it fly. I’m confident in that shot (the 3-pointer). I don’t like to settle, but if I got it, especially a corner three, I am going to let it fly. Philadunkia: As an opposing player what was your view / thoughts of the 76ers rebuilding process? Henderson: I can’t say that as an outside player I paid as much attention to it as I do now that I am part of the organization. But from a far you could see that they had some talent. I’m not sure you could tell what the plan was with the talent, but you could tell that had a couple pieces and that the coach had some energy for sure. I didn’t know coach Brown before I can here. I knew he was in San Antonio before the Sixers, but you could tell that he was pushing those guys and really as bad as things were going in the win / loss columns that it wasn’t just about that for him. I used to watch games on the League Pass and you could see that he was trying to teach guys things and get them to play the right way, no matter what the score. I could tell allot about coach Brown before I even spoke to him. Now I know they have a guy in the general manager spot with Bryan who knows what he is doing. He’s been around for some time now. He knows the game. His father knows the game. Philadunkia: What is your plan for the rest of the summer and when do you think you will start working out here in Philadelphia with the rest of the team? Henderson: I am here in Charlotte, NC and I finished my work out for the day so I am just hanging by the pool. I think I will be here for another week so I am just going to try and enjoy it. I think I will probably be headed to Philly in a week or week and a half to start training there. My family here is going to move up and all of my family from growing up is still in the area and I’ll get some help getting acclimated from them. I’m looking forward to getting up there. Philadunkia: What are your expectations for the upcoming season and we are not necessarily talking from a win-loss standpoint? Henderson: I don’t like to put numbers on things because you ar then either expected to get to that number or you are low balling yourself. I know one thing is that we are going to bring a style of basketball that people will enjoy watching. We are going o play hard every night; Coach Brown will demand that of us. We have high character guys that will be unselfish and about winning. When you can combine those things, it’s not saying you are going to win, but you have a chance to win every night. Mix some talent in there, which we do have, and I think it’s looking up for us. Thanks to Gerald for his time and answers. You can listen to the entire podcast with Gerald here.